The VMU208 System Wires Vibration Data Right Into Your Plant Network - By using a VMU208 and NCA, vibration data from "bad actors" can be digitized and monitored over your plant network. The VMU208 digitizes vibration data and converts it to RS485 which can be sent over a wire for thousands of feet. Using RS485 also allow multiple VMU's to be tied together, allowing more than 200 points to be monitored using one wire if needed. Riotech's NCA converts data from a RS485 network to an Ethernet network, where it can be seen anywhere on your intranet using Rioserver software. 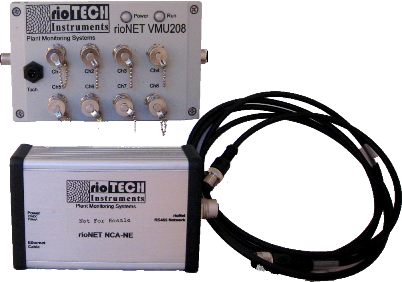 Riotech Also Offers Wireless Solutions - For applications where long wiring distances are required, or assets are spread out, we recommend our VMU208R Series which offer wireless systems with easy setup of continuous online vibration monitoring systems.